You might be questioning why, despite the significant amount of banks fees you pay, some of your banks are constantly raising the subject of needing additional profitability on your relationship? The key element to consider when trying to answer these questions is the bank’s internal rating and how they rate the risk of doing business with your company. Banks’ internal ratings are somewhat like ratings produced by Moody’s, Standard & Poor’s, and other public rating agencies in that they summarize the risk of loss due to failure by a given borrower to pay as promised. However, banks’ own internally designed rating systems are different from those of the rating agencies in architecture and operating design as well as in the uses to which ratings are put. One reason for these differences is that banks’ ratings are determined by bank credit analysts and credit committees utilizing their own varied levels of expertise of your company, your customers, your industry, your geographical footprint, the associated political environments of foreign revenues and suppliers, and other factors, the results of which are usually not revealed to you other than in pricing. The importance of determining its own internal client credit ratings has always been critically important to a bank. But since 2006, when increased capital requirements of Basel II and III were instituted in Europe and the United States, it became even more important. So, although these internal ratings continue to be an essential ingredient in effective credit risk management for major U.S. banks, the increased capital pressures and resulting variations in rating methodologies among all your banks can be daunting for clients to understand and interpret. 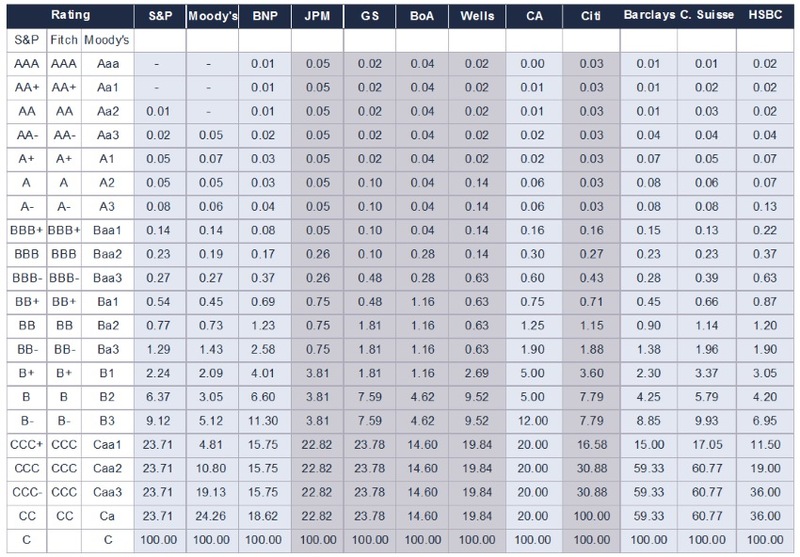 Why are internal ratings so important to each bank? Most large banks use ratings in all key areas of risk management that involve credit, such as guiding the loan origination process, portfolio monitoring and management reporting, analysis of loan loss reserves or capital adequacy, relationship profitability and ultimately loan pricing. The credit rating is designed to provide the bank an indicator of your company’s credit worthiness, translated into probability of default (PD in the next 12 months or within a period reflective of your specific situation). First, each bank has a different expected return objective, and employs a different strategy in how to maximize the relationship value. Knowing whether your bank requires the credit alone to be ‘self-profitable’, or does the bank also rely on side businesses like treasury management, FX, Corporate Trust, and others, to achieve their internal expected returns? Very importantly, Redbridge has observed a significant difference in banks’ credit analysis methodology that determines their own internal credit rating. Not infrequently, bank scoring has been observed to be from 1 to 3 notches different between banks for the same company! One rating notch could be worth between 10 to 20bp in debt pricing. Two notches could translate into 40bps. Awareness of this is paramount in negotiating your cost of debt with each of your banks. In a syndication process, how do you achieve an equitable pricing structure when your banks don’t look at you the same way? Obviously banks may disagree on their complex analysis and determination of the company’s credit worthiness. However, if you see a difference of 3 notches between banks bidding, there likely is more than a disagreement in methodology! This needs to be raised for further evaluation, clarity and transparency. According to Redbridge, it is NOT uncommon to see differences of 1 or 2 notches. The specifics of internal rating system architecture and operation differ substantially across banks. The number of grades and the risk associated with each grade vary across institutions, as do decisions about who assigns ratings and about the manner in which rating assignments are reviewed. In the chart below, Fortune 1000 companies are grouped into three segments. From a cost perspective, looking at those companies within the Fortune 101-500 group, you can see 35% of these companies actually draw down their revolver. The amount they draw down averages 36%. According to an annual survey by Redbridge, the average revolver line is $600Million. So, if one of these companies draws down 36% of $600Million, or $216Million, and if a notch is valued at 20bps, a two notch difference could cost approximately $864K in extra interest annually. Over five years, $4,320K! If your company is in this Fortune 101-500 group, this amount likely hits your radar!! And, although a three notch difference is unusual, this equates to paying an additional $6Million in bank fees over five years. Source: Redbridge Debt & Treasury Advisory, study of bank’s annual reports. Publically rated companies do have a benchmark with their public rating but banks will likely run their internal models and use their internal credit rating to compute RAROC, measure profitability, price operations. 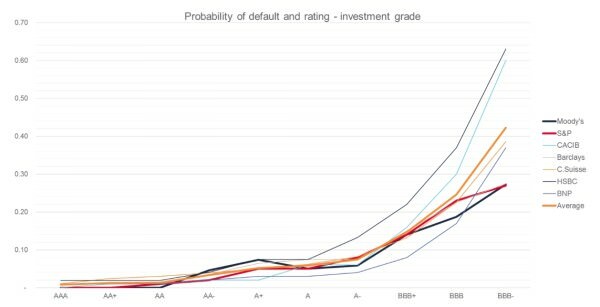 Based on our own experience, we also observed that bank’s internal credit ratings are most likely less conservative than public rating agencies. We have even seen a difference up to 2 notches between public ratings from S&P & Moody’s who are accountable to a much broader public than banks. And this is even more critical if you are a non-rated company. How do you negotiate your credit structure without any indication of your credit profile? It is obvious that U.S. banks don’t divulge their internal credit ratings. Why? Is it just the culture of American banks to mask this important risk-evaluation process? In several European countries, banks are required by law to provide the internal rating when asked by their client. You might expect this to be similar in one of the most advanced economies of the world, but apparently it is not. On the other hand, do corporations ask for it? Maybe not! Do most corporations organize a “bank day” to better communicate and describe their financial performance to banks? Their sharing of inside information that is useful to banks in calculating financial performance and risk assessment ratios, discussing strategy and vision of the future. This should be mirrored by their banks in sharing their rating methodologies. When you compare the typical transparency of your rating agencies in explaining their methodology and considerations, you would expect your banks to provide the same level of transparency. The message here is to ask your banks to discuss specifically how they determine their own internal credit scoring and rating of your company. Bank internal ratings are critical to understand your credit worthiness and better negotiate your credit pricing structure. Given recent reforms in banks’ capital frameworks, an opportunity exists for corporations, particular very large corporations, to have these conversations. All corporations should ask and banks should be keen on sharing this information in a very transparent and instructive way. With these open conversations, the quality and the understating of the banking relationship will be strengthened, transparency and dialogue will be enhanced, and fairness will be achieved through better parity in ratings among their banks. You deserve a trusted banking relationship.